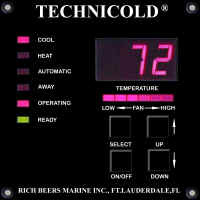 TECHNICOLD® FX Digital Environmental Control is much more than an air conditioning temperature control. This user friendly menu selectable control with 15 function programs lets the boat owner tailor the air conditioning system to meet individual requirements. For normal operation all that is required is to push the power button, set the desired temperature, sit back and enjoy. The internal computer maintains cooling or heating as needed to maintain the temperature while automatic monitoring and self-diagnostic systems function. The dehumidify control mode makes environment maintenance a breeze, helping to ensure the boat owner a dry, odorless boat even while unattended. An attractive display panel with LED lights provides a visual display of the current temperature, programming and fault messages. As light conditions change in the cabin an automatic dimmer sensor adjusts the panel display brightness. TECHNICOLD® FX Digital Environmental Control design for simplicity of operation is only matched by its simplicity of installation. The control essentially consists of the display panel and power control module, which are easily connected with phone-type polarized plug connectors. The condenser sensor and optional temperature sensor are connected to the main powerboard in the same manner. A terminal strip on the control box makes for quick connection to most any marine air conditioning system.